I want to extend an invitation to our seventh gathering of the Seven Nights of Worship for Connecticut (7NOW/CT) on Friday, January 25, at 7:00 PM. 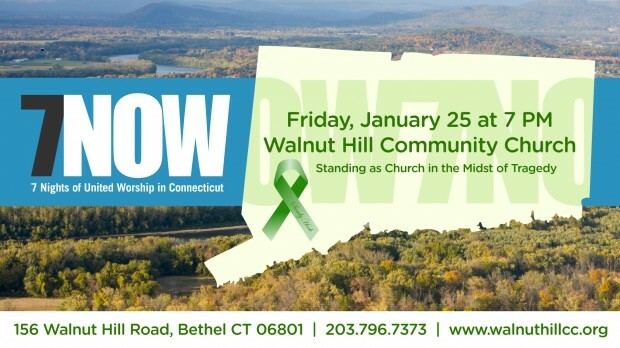 We slated this final meeting for Walnut Hill Church in Bethel, CT months before the words “Sandy Hook” took on the tragic significance they now hold for all of us. Walnut Hill Church is about a mile from Newtown and hundreds of their congregation live in that town; four of their flock were killed in the massacre. Now, at the end of this month we will gather at Walnut Hill to worship the Lord as a united Body and to pray for his intervention in our state. Please advertise to your flock this opportunity to worship the Lord and to cry out to Him in the face of this tragedy.